GMAT: "Drawn as Accurately as Possible"
Assumption and Estimation. 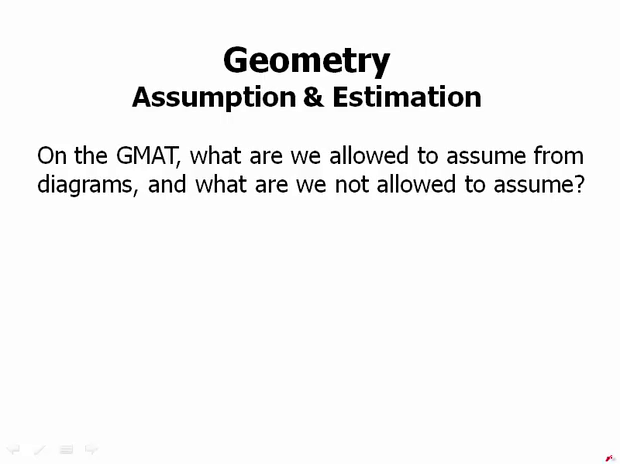 In other words on the GMAT, what are we allowed to assume from diagrams, and what are we not allowed to assume? First of all, we're always allowed to assume that lines that look straight actually are straight. So suppose we're given a diagram like this. Certainly looks like, as we go from B, to A, to C, that what we have is a straight line. Now technically, if someone were being really tricky, they could put a slight bend at A. A could be say 179.9 degrees instead of exactly 180 degrees. So we are guaranteed this is one thing the GMAT absolutely is not gonna do to us. We are guaranteed of it. It looks straight, it is money in the bank. It absolutely is straight. So we can trust that. If it looks straight, it is straight. But that's about the only thing you can trust. You can't trust how things look in general. And here's what I mean by that. If two lengths look the same, but no other indication is given, then you can't assume that they are exactly the same. Even if they're close, they're not exactly the same. Similarly, parallel and perpendicular are precise relationships. So if something looks parallel, it may not be exactly parallel. If it looks perpendicular, it may not be exactly perpendicular. Now a couple of videos ago, we talked about several special properties of parallel lines. None of those are true if the lines are almost parallel. And much in the same way, we're gonna discuss many important right angle properties in upcoming videos. None of those right angle properties are true, if the angle is almost a right angle. So in the diagram, you could have something that is almost a right angle, and it would look right or almost parallel, and it would look parallel, but we can't assume that it has those special properties. Look at these diagrams. Certainly, it would be tempting to assume that what we have here is a right triangle and a square. And many test takers would assume this and just base all their calculations on those assumptions. And that is not correct. So this is, these are examples of diagrams the G might, actually could give us here. These are drawn to scale. As it turns out, FEG is 89.9 degrees. So that is not a right angle. That is not a right triangle at all. It looks like a right triangle, but it's not. So none of the right triangle properties are true for that. Technically that is an acute triangle, because all three angles in that triangle are less than 90 degrees. Similarly with the thing that looks like a square, it's not even pretending to be a square. None of the angles in that are right angles. They're all close to 90, but none of them are 90. Three of the sides are equal, but LM actually is a slightly different length. So it doesn't have equal sides. It doesn't have equal angles. It's not even pretending to be a square. So certainly none of the square properties are true for that. And yet if that diagram appeared on the test, many test takers would blithely assume, oh look, a square. And base all their calculations on that. We can run into all kinds of trouble if we are naive in the way that we interpret diagrams. What can we trust about a diagram? Well, on the GMAT it depends on whether we're talking about problem solving or data sufficiency. The following passage appears on the GMAT test itself in the quant section and it also appears in the official guide, for the problem solving section. A figure accompanying a problem solving question is intended to provide information useful in solving the problem. Figures are drawn as accurately as possible, exceptions will be clearly noted. Hold on a second. Very important phrase there, drawn as accurately as possible. Every diagram in GMAT problem solving is drawn as accurately as possible, unless there's a note that says, figure not drawn to scale. So the default assumptions is, you always have an accurate diagram on the problem solver. That's huge, right there. This means, on the problem solving, we certainly can estimate approximate sizes and angles. In this triangle, we know that the angles at G and J are either equal or close in value. We can't just assume that they're equal. They may be equal, or they may just be close in value. But we do know that one is not radically bigger than the other. Similarly, the lengths of GH and HG, they might be equal, they might be close in value. We can't assume that they're precisely equal, but we know that they're not far apart in their value. We know that the long side, GJ, is longer than the other two sides, but is not even as large as twice as long. And the angle at H, angle GHJ is clearly the largest angle. To my eye, that appears to be an angle slightly larger than 90 degrees. Certainly is, it is not an acute angle. And so if someone tried to tell me it was 70 degrees, that clearly would be wrong. And if someone tried to tell me it was, it was much larger than 90 degrees, for example, someone tried to say it was 150 degrees, we would know that would be wrong as well. Suppose we were given say, GJ equals 12, and asked to find GH. Of course we'd have to be given some other information in the question. But certainly we would expect something in the range, based on this diagram, we would expect something in the range between seven and ten, would be the approximate range we'd expect for the length of GH. We could certainly eliminate answers such as GH equals four, or GH equals 17, based on the diagram. So we would never be able to narrow down to a single answer, simply by estimating from the diagram, but we sometimes can eliminate some answers, and we can verify whether a number in the diagram we calculated seems reasonable. So this is the value. On data sufficiency, we are not guaranteed that the diagrams will be drawn to scale. Now this is really tricky. If information is stated factually in the prompt as it often is, the diagram will reflect the prompt information, but it won't necessarily reflect any of the information in either statement. And of course we're always given more information in those statements. And so here we'll have to go to use our visual information, how does the information given in the statement, change or restrict the diagram? So that won't be visually provided, that's something we're gonna have to imagine ourselves. In summary, we can always assume that any line that looks straight really is straight. That's one thing we can assume. We can't assume from appearances equal length, we can't assume things that look parallel are, or things that look perpendicular are. On the problem solving, diagrams are drawn to scale so we can use visual estimation, and that's a powerful aide. On Davis Sufficiency, diagrams are not necessarily drawn to scale. They reflect the prompt information, but not necessarily the information in the statements.